Behavioral effects of stimulant drugs are influenced by non-pharmacological factors, including genetic variability and age. We examined acute and sensitized locomotor effects of methylphenidate in adolescent and early adult male Sprague Dawley (SD), spontaneously hypertensive (SHR) and Wistar Kyoto (WKY) rats using a drug regimen that differentiates clearly between initial and enduring differences in drug responsiveness. We probed for strain and age differences in the sensitizing effects of methylphenidate using a cocaine challenge. Methylphenidate was administered to the rats in a non-home environment. Strain differences in sensitivity to single methylphenidate injections depend on age and change with continuing drug pretreatment. While SHR rats are more sensitive to methylphenidate relative to WKY regardless of age and pretreatment day, SHR rats become more sensitive to methylphenidate than SD rats towards the end of pretreatment during early adulthood. SD rats exhibit greater sensitivity to methylphenidate relative to the WKY group during adolescence, an effect that dissipates with continued drug pretreatment during adulthood. Remarkably, only SHR rats, regardless of age, exhibit methylphenidate-induced cross-sensitization to the behavioral effects of cocaine. Our findings suggest that SHR rats are more vulnerable than other strains to methylphenidate-induced cross-sensitization to cocaine, at least when methylphenidate is administered in a non-home environment. Given that SHR rats are typically used to model features of attention deficit hyperactivity disorder, these findings may have important implications for the treatment of this disorder with methylphenidate. Acute and chronic locomotor and neurochemical effects of stimulant drugs are determined not only by the pharmacological properties of the drug itself, but also by a multitude of non-pharmacological factors, such as genetic variability and age [1–8]. Recently, Dafny and colleagues reported strain differences in sensitization to the locomotor activating effects of methylphenidate between Sprague Dawley (SD), spontaneously hypertensive (SHR) and Wistar Kyoto (WKY) rats, the extent of which was shown to depend on age [9–11], reviewed in . Because SHR rats are typically used to model features of attention deficit hyperactivity disorder (ADHD), such findings are particularly salient and warrant further exploration. In the aforementioned studies by Dafny and colleagues [9–11], rats were pretreated with methylphenidate in their home cages and, following a short withdrawal period (2 days), were tested for sensitization with a methylphenidate challenge. Here we examined strain and age differences in the acute and cross-sensitizing behavioral effects of methylphenidate by pretreating rats with the drug in an environment other than home, as administering the drug to rats in the environment in which they live is known to attenuate the locomotor activating effects of stimulant drugs . We also used a drug treatment regimen that differentiates clearly between initial and long-lasting differences in drug responsiveness. While small sensitization effects are often detected soon after drug exposure, their magnitude increases over time [14–16], indicating that neuroadaptations underlying sensitization continue to develop long after the end of repeated drug pretreatment. Sensitization effects observed at early withdrawal times are likely to rely on transient changes in receptor function [17–19], whereas enduring sensitization requires long-lasting, perhaps permanent, neuroadaptations [19, 20]. Moreover, to assess the generalizability of methylphenidate-induced sensitization to illicit drugs, we probed strain and age differences in the enduring sensitizing effects of methylphenidate using a cocaine, rather than a methylphenidate challenge. This study was approved by the Concordia University Animal Research Ethics Committee. Figure 1 illustrates the design of the experiment. Briefly, adolescent and early adult male SD (adolescent: 100-120 g; early adult: 220-270 g), SHR (adolescent: 110-140 g; early adult: 160-180 g), and WKY (adolescent: 70-110 g; early adult: 170-190 g) rats (Charles River, St Constant, Quebec) were housed in pairs in a room with a 12-hr light-12-hr dark cycle (n = 6 for all groups unless stated otherwise). Rats arrived to the animal colony at five (adolescent) and eight (early adult) weeks of age and were given a few days to acclimate before commencement of drug pretreatment. Locomotor activity was assessed in testing chambers (40.2 × 20.2 × 30.5 cm) with transparent Plexiglas fronts, stainless steel grid floors, and wooden side walls, backs, and ceilings. A single count of locomotor activity was defined as a consecutive interruption of two photocells that were located along the longitudinal axis of each chamber, 4.8 cm above the floor. The first part of the experiment (pretreatment) lasted ten consecutive days, wherein we transported animals to the testing chambers and administered injections of saline (1 ml/kg i.p.) or methylphenidate (2.5 mg/kg i.p. ; methylphenidate hydrochloride, Medisca, QC, Canada). This dose was selected because it was previously shown to be the lowest dose to elicit behavioral activation in the three rat strains used in the present study . Locomotor activity was recorded for 30 min and the animals were then returned to their home cage. The second part of the experiment (test) took place ten days following the last pretreatment injection. During this test, we gave all animals a challenge injection of cocaine (5 mg/kg i.p., cocaine hydrochloride, Medisca). This low dose was chosen so as to elicit locomotion during the test, rather than stereotypy . Locomotor activity was recorded for 1 hr. Two- and three-way ANOVAs were used as required to analyze behavioral effects. Significant main effects and interactions were followed by Tukey post-hoc tests. Diagrammatic illustration of experimental procedures conducted in adolescent and early adult Spontaneously Hypertensive, Sprague Dawley, and Wistar Kyoto rats. MPH: methylphenidate. As shown in Figure 2, the first injection of methylphenidate administered to adolescent SD, SHR and WKY rats induced an increase in locomotor activity (Two-way ANOVA (strain × drug treatment); significant main effect of drug treatment: F(1, 30) = 29.93, p < .0001). However, WKY rats, regardless of drug pretreatment, engaged in significantly less locomotor activity than SHR rats (significant main effect of strain: F(2, 30) = 4.12, p = .02; significant difference between WKY and SHR rats, p < .05). An acute injection of methylphenidate also increased locomotor activity within early adult rats, however, the WKY group exhibited lower methylphenidate-induced locomotor activity in comparison to the SHR group (Two-way ANOVA (strain × drug treatment); significant main effect of drug treatment: F(1, 29) = 71.32, p < .0001; significant strain × drug treatment interaction: F(2, 29) = 4.45, p = .02; significant difference between methylphenidate treated SHR and methylphenidate treated WKY, p < .001). These results are in stark contrast to the findings of Dafny and colleagues [9–11], showing that SHR rats respond less to acute methylphenidate in comparison to SD and WKY groups. This key difference between our findings likely reflects the influence of environmental context in the modulation of the locomotor-activating effects of stimulant drugs  and suggests that SHR rats may be more sensitive than other strains to the attenuating effects of the home environment on stimulant-induced locomotor activity. Of note, the baseline hyperactivity typically associated with SHR rats was observed only in comparison to WKY rats, and only within the adolescent group. 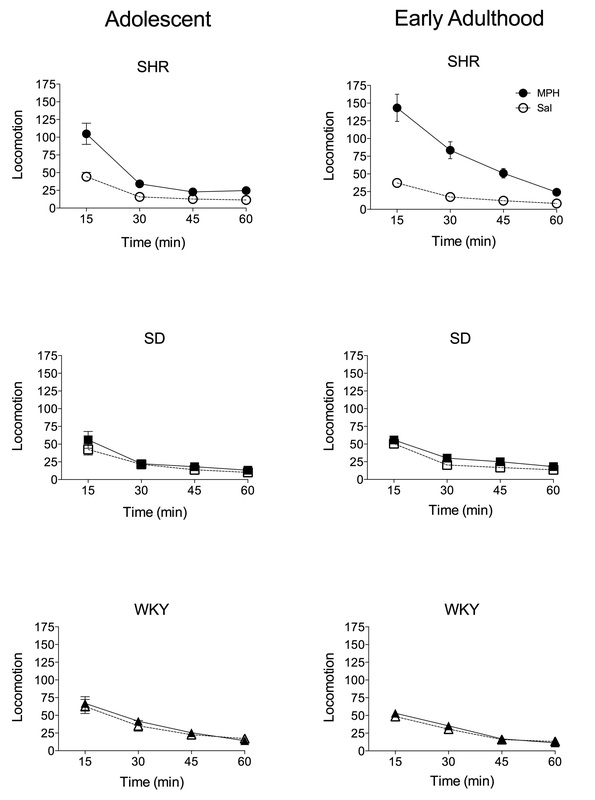 Behavioral responses to the first injection of methylphenidate in adolescent and early adult Spontaneously Hypertensive, Sprague Dawley, and Wistar Kyoto rats. * p < .05, significantly different from Spontaneously Hypertensive rat. *** p < .001, significantly different from Spontaneously Hypertensive rat. **** p < .0001, significantly different from methylphenidate-treated animals. Adult SHR group pretreated with methylphendiate, n = 5. All other groups, n = 6. SHR: Spontaneously Hypertensive rat; SD: Sprague Dawley; WKY: Wistar Kyoto; MPH: methylphenidate. Across multiple pretreatment days (Figure 3), locomotor activity remained elevated in response to methylphenidate administration as compared to saline in both adolescent and early adult SHR, WKY, and SD rats (adolescent group; Three-way ANOVA (strain × drug pretreatment × day): significant main effect of drug pretreatment: F(1, 30) = 84.44, p < .0001; early adult group; Three-way ANOVA (strain × drug pretreatment × day): significant main effect of drug pretreatment: F(1, 29) = 116.68, p < .0001). Within the adolescent group, the magnitude of locomotor activity elicited by methylphenidate was greater in SHR and SD rats compared to WKY rats (significant drug treatment × strain interaction: F(2, 30) = 4.49, p = .02; significant differences between SHR and SD rats with WKY rats, p < .01). Within the early adult group, however, the picture is more complex because strain differences in methylphenidate-induced locomotor activity differ as a function of pretreatment day (significant drug pretreatment × strain × day interaction: F(18, 29) = 4.57, p < .0001. Specifically, while it is clear that SHR and SD groups exhibit similar drug-induced locomotor activity on the first five pretreatment days, the SHR group (n = 5) shows a dramatically greater response to methylphenidate on the remaining days than the SD group (p < .01). In comparison to WKY rats, the SHR group shows significantly greater activity across all pretreatment days, excepting day 5 (day 1, p < .05; days 2 – 4, p < .01; days 6 – 9, p < .01; day 10, p < .05). SD rats exhibit similar levels of methylphenidate-induced locomotor activity to WKY rats except for pretreatment days 4 and 5, wherein SD rats exhibit greater behavioral effects than WKY rats (p < .05). Thus, these findings reveal that the strain differences in sensitivity to methylphenidate change with continuing drug pretreatment. While SHR rats remain more sensitive to methylphenidate relative to WKY regardless of age and daily drug exposure, SHR rats become more sensitive to methylphenidate than SD rats towards the end of pretreatment during early adulthood. In a similar way, SD rats exhibit greater sensitivity to methylphenidate relative to the WKY group during adolescence, an effect that dissipates with continued drug pretreatment during early adulthood. Behavioral responses to injections of methylphenidate or saline in adolescent and early adult Spontaneously Hypertensive, Sprague Dawley, and Wistar Kyoto rats across the 10 pretreatment days. Filled symbols represent methylphenidate-treated animals. Open symbols represent saline-treated animals. Circles, squares and triangles represent Spontaneously Hypertensive, Sprague Dawley, and Wistar Kyoto rats, respectively. Adult SHR group pretreated with methylphendiate, n = 5. All other groups, n = 6. Please see text for statistical results. SHR: Spontaneously Hypertensive rat; SD: Sprague Dawley; WKY: Wistar Kyoto; MPH: methylphenidate; Sal: saline. Results of the sensitization test are shown in Figure 4. Sensitization is defined as a greater response to the drug challenge injection in drug- versus saline-pretreated animals within each strain. It is remarkable that, at both ages, only SHR rats exhibit methylphenidate-induced cross-sensitization to the behavioral effects of cocaine (adolescent group: Two-way ANOVA (drug pretreatment × time): significant drug × time interaction, F(3, 30) = 9.1, p < .0001; significant differences at 15 min, p < .0001; early adult group: Two-way ANOVA (drug pretreatment × time): significant drug × time interaction, F(3, 29) = 18.1, p < .0001; significant differences at 15 - 30 min, p < .0001 and at 45 min, p < .05). It should be noted that pretreatment with methylphenidate may have altered the baseline locomotor activity of SHR rats, and thus the augmented locomotor response may be a composite of sensitized baseline locomotor activity and sensitized cocaine-induced locomotion. The absence of sensitization in SD and WKY groups is unlikely to be due to increased stereotypy because of the low cocaine dose used to probe for sensitization . Behavioral responses to a challenge injection of cocaine in Spontaneously Hypertensive, Sprague Dawley, and Wistar Kyoto rats pretreated with methylphenidate or saline during adolescence or early adulthood. Only Spontaneously Hypertensive rats exhibit methylphenidate-induced behavioral cross- sensitization to cocaine. Adult SHR group pretreated with methylphendiate, n = 5. All other groups, n = 6. Please see text for statistical results. SHR: Spontaneously Hypertensive rat; SD: Sprague Dawley; WKY: Wistar Kyoto; MPH: methylphenidate; Sal: saline. These results are not in accord with the conclusion reached by Dafny and colleagues that “the SHR group is the least susceptible to development of behavioral sensitization” . Rather, our results suggest that SHR rats are more vulnerable than other strains to methylphenidate-induced cross-sensitization to the locomotor-activating effects of cocaine when methylphenidate is administered in an environment other than home. While the present results are limited to cross-sensitization of the locomotor-activating effects of methylphenidate and cocaine, our findings suggest that individuals with ADHD that are treated with methylphenidate may have greater vulnerability to abuse illicit drugs than normal individuals, a possibility that has recently been supported , but see [23–25]. This research was supported by a grant from the Natural Sciences and Engineering Research Council of Canada to Andreas Arvanitogiannis as well as by a grant from the “Fonds de recherche du Québec - Santé” to the Center for Studies in Behavioural Neurobiology. Leora Yetnikoff was supported by a postdoctoral fellowship from the Fonds Québécoise de la recherche sur la Nature et la Technologie. Software for data acquisition was written by Steve Cabilio. LY carried out all experimental procedures, performed the data analysis, contributed to the interpretation of the results, and worked with AA to write the manuscript. AA conceived of the study, contributed to the interpretation of the results, and worked with LY to write the manuscript. Both authors read and approved the final manuscript.